Vor 3 Wochen hat das WM Finale in Russland stattgefunden. Kroatien hat gegen Frankreich gespielt. Ich habe nur die erste Halbzeit gesehen, weil es schon nach Mitternacht angefangen hat, und wir am nächsten Tag zum Wandern verabredet waren. Bevor ich nach Japan kam, habe ich schon viel vom japanischen Sommer gehört, der wirklich sehr heiß und vor allem schwül sein soll! Meine Arbeitskollegen hier haben mir das auch so bestätigt, und vor allem Kyoto ist im Sommer besonders heiß, weil es von Bergen umgeben ist! Deswegen hatte ich schon etwas Angst davor, dass der Sommer anfängt. Aber ich wollte auch unbedingt wissen, wie es wirklich ist… Momentan fühlt es sicher allerdings so an, dass er gar nicht aufhört! Die Temperaturen liegen immer so bei 35Grad plus! In den letzten Tagen sogar bei 39Grad, oder mehr. Man will wirklich nicht rausgehen, und ich kann jetzt gut verstehen warum die Japaner nicht ohne Klimaanlage auskommen! Im Sommer gibt es auch wirklich viele Taifune, obwohl ich immer dachte, dass die erst so ab September anfangen… dadurch regnet es sehr viel, aber es wird dadurch nicht wirklich kälter. Dafür gibt es im Sommer allerdings auch viele Festivals wie das Gion-Matsuri in Kyoto, oder auch das High School Baseball Tournament Koushien. 3 weeks ago the World Cup Final took place in Russia. It was a game between Croatia and France. I have only seen the first half, because I had an appointment to go hiking on the next day and the game started already after midnight. 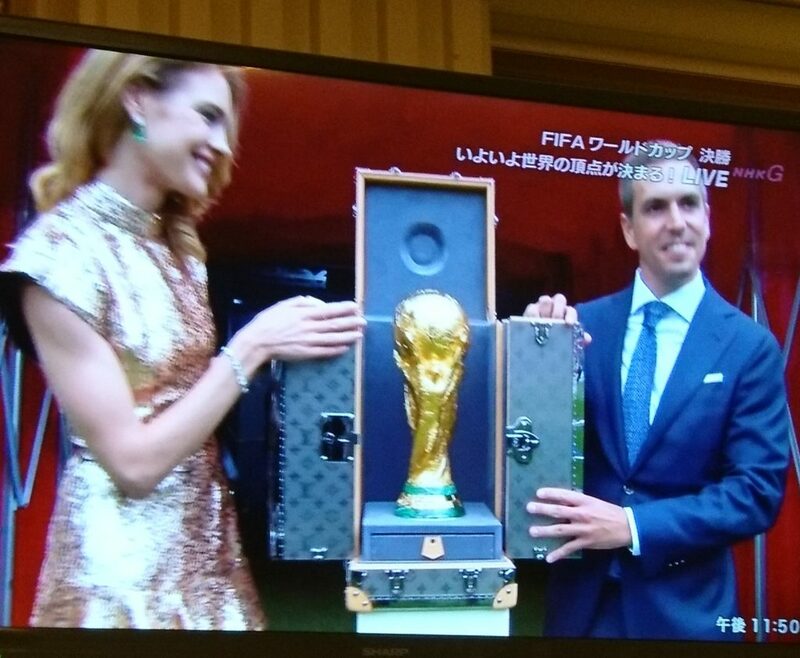 Before the game started, the former German player Philipp Lahm brought the trophy into the stadium. I really hoped that the final would be against the German team… but a least a German player held the trophy in his arms on that day. Before I came to Japan I have heard a lot about the summer in Japan. Like that it is very hot and humid and the temperatures are very high. My colleagues at the work place also told me the same thing, and that Kyoto is especially hot because it is surrounded by mountains. The temperatures are around 35degree Celsius and over that. Some days before it was even around 39degrees Celsius…There are also warnings about heat stroke, and people even die because of it! I really know now why the Japanese people need an air conditioner in the house, they also have them in America, but in Germany they don’t have them! In the summer there are also many taifuns coming to Japan. I thought they would be start in September. But although it rains a lot because of the taifun, it doesn’t get cooler. And there are many cicadas chirp when summer starts. There are many varieties of them and they all have a different voice. But they only live one week.